[center-hidden]Magunaw man ang mundo, tayo pa rin ang magkakasama. Welcome to Our 397th HOME, Kapamilya! once a TT is made, ask a mod or admin to edit it. thanks. Humahataw na ulit Afternoon Prime ng GMA at natatalo na movies as usual initially lang talaga nanalo ang movies :bop: ABS gising kalian ba aayusin ang afternoon line up! Good ratings for the weekend, masaya ako sa ratings ng Home Sweetie Home, more sitcoms pa ABS! Hataw din sa ratings ang Ipaglaban Mo! UAAP 77 Men's Basketball Finals: Game 3 Gate Attendance: a record-setting 25,118. The Trial ('14 Chito Roño): Fairly compelling, but dramatically uneasy. The Trial is actually kind of a bait and switch. It largely dodges the minefield of its premise by focusing on a different arc. The story it ends up delivering has its merits, but it does kind of feel like a cop-out. laki rin ng binagsak ng rating ng I Do, single digit na lang sila last Sat. kaya pala mapapaaga ang pagpapalabas ng TVP S2 para makabawi sa rating. 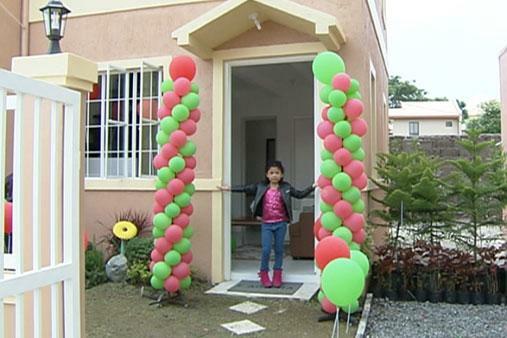 MANILA -- (UPDATED) "The Voice Kids" grand champion Lyca Gairanod finally got her new house in General Trias, Cavite. The nine-year-old used to scavenge junk in Tanza, Cavite before winning the TV singing contest last July. Aside from P2 million in cash and a recording contract, Gairanod also won a house and lot from Camella. On Wednesday, Gairanod with her parents and siblings finally moved to their new home. Although she won a singing contest, the little girl's post-"Voice Kids" career has also included acting stints. She played herself in an episode on the long-running drama anthology "Maalaala Mo Kaya," which drew monster ratings. Gairanod also appeared in the primetime drama "Hawak Kamay," with Piolo Pascual. Up next for the child star is another acting project: ABS-CBN's upcoming series "Nathaniel" with child actor Marco Pingol in the title role. Bat walang title ang thread? Eto na lang kay Thelo ang gamitin natin, sana medit ng mods. PEXTalk 397 : Wag Ka Nang Umiyak , Bes! Forevermore Na Ang Thread Na Ito ! Haller billy! Sana nga baka sakaling maisalba ang KGold! kaya nga eh!!! ang dami na kayang choices for KGOLD leads! may isa pa ngang nag-SONA sa ABS forums dahil sa "lack of experimentation"..
tama na rin pagtitipid at kahit OK nang isugal ang next big bets sa Primetime, sana merong daytime soaps pa rin!! !